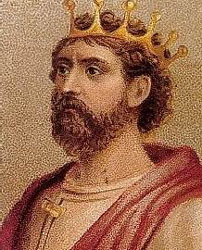 Edmund I, King of the English (d. 946), was the son of Eadgifu, third wife of Edward the Elder, and half-brother to his predecessor Aethelstan. He succeeded to the throne in 940, but had already played an active part in the previous reign, especially when he fought by the side of his half-brother in the great battle of Brunanburh. In the first year of his reign Edmund had trouble with Olaf or Anlaf Sihtricsson, called Cuaran. The latter had just crossed from Ireland and had been chosen king by the Northumbrians, who threw off their allegiance to Edmund. Anlaf took York, besieged Northampton and destroyed Tamworth, but was met by Edmund at Leicester. The enemy escaped, but a peaceful settlement was made by the good offices of Odo of Canterbury and Wulfstan of York. Simeon of Durham states that a division of the kingdom was now made, whereby Edmund took England south of Watling Street and Anlaf the rest. This division seems not credible, especially in face of the poem inserted in the chronicle (sub anno 942). There can be little doubt that the story told there of the reconquest of Northern Mercia by Edmund refers to the compact with Anlaf, made as a result of the campaign, and it is probable that Simeon's statement is a wide exaggeration, due in part at least to a confused reminiscence of the earlier pact between Alfred and Guthrum. All Mercia south of a line from Dore (near Sheffield), through Whitwell to the Humber, was now in Edmund's hands, and the five Danish boroughs, which had for some time been exposed to raids from the Norwegian kings of Northumbria, were now freed from that fear. The peace was confirmed by the baptism of Kings Anlaf and Raegenald, Edmund standing as sponsor, but in 944 or 945 the peace was broken and Edmund expelled Anlaf and Raegenald from Northumbria. In 945 Edmund ravaged Strathclyde, and entrusted it all to Malcolm, King of Scotland, on condition that he should be his fellow-worker by sea and land, the object of this policy being apparently to detach the king of Scots from any possible confederacy such as had been formed in 937. On the 26th of May 946 Edmund's brief but energetic reign came to a tragic conclusion when he was stabbed at the royal villa of Pucklechurch, in Gloucestershire, by an exiled robber named Liofa, who had returned to the court unbidden. Edmund, the "deed-doer" as the chronicle calls him, "Edmundus magnificus" as Florence of Worcester describes him, perhaps translating the Saxon epithet, was buried at Glastonbury, an abbey which he had entrusted in 943 to the famous Dunstan.